The UK environment secretary said that acidification provided a "powerful incentive" to cut carbon emissions. Ocean chemistry is changing because water absorbs extra CO2 from the air. Some believe this impact of rising CO2 levels could be as significant as climatic change, though it is rarely discussed at the UN climate convention. The UN summit in Copenhagen, which started a week ago, is scheduled to conclude on Friday, when more than 100 world leaders will attend in an effort to agree a new global treaty on climate change. The IPCC forecasts that ocean pH will fall by "between 0.14 and 0.35 units over the 21st Century, adding to the present fall of 0.1 units since pre-industrial times"
The science has come to prominence only within the last five or six years, and most of the details were not available when the convention was signed in 1992. 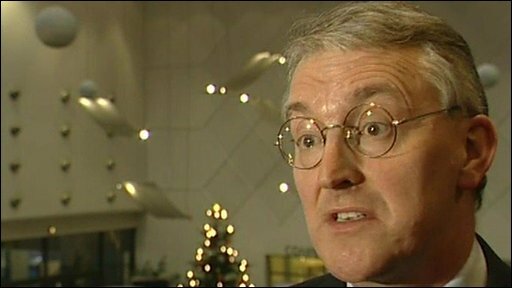 "We know that the increasing concentration of CO2 [in the air] is making the oceans more acidic," Mr Benn told BBC News. "It affects marine life, it affects coral, and that in turn could affect the amount of fish in the sea - and a billion people in the world depend on fish for their principal source of protein. "It doesn't get as much attention as the other problems; it is really important." 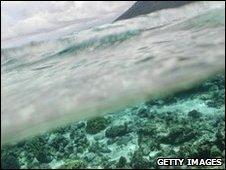 In September, the UN-backed study into The Economics of Ecosystems and Biodiversity (Teeb) concluded that the widely-endorsed target of trying to stabilise atmospheric concentrations of CO2 or their equivalent to around 450 parts per million (ppm) would prove lethal to much of the world's coral. Mr Benn made his speech during the summit's "oceans day" at a meeting organised by Stanford University and Scripps Institution of Oceanography, both based in California. "Unlike global warming, which can manifest itself in nuanced, complex ways, the science of ocean acidification is unambiguous," said Andrew Dickson, a Scripps professor of marine chemistry. "The chemical reactions that take place as increasing amounts of carbon dioxide are introduced to seawater have been established for nearly a century." The oceans and atmosphere are constantly exchanging CO2. Concentrations in the atmosphere are now about 30% higher than in pre-industrial times; a proportion of this is absorbed by seawater, which results in rising concentrations of carbonic acid. As a result, the pH of seawater has fallen by about 0.1, and a further change of 0.3-0.4 is expected by the end of the century. This is likely to affect the capacity of organisms including molluscs, coral and plankton to form "hard parts" of calcium carbonate. A 2007 study showed that rates of coral growth on the Great Barrier Reef had fallen by 14% since 1990. Mr Benn said that the Intergovernmental Panel on Climate Change (IPCC) should investigate ocean acidification during its next major assessment of the Earth's climate, scheduled for release in 2013. The UK's Climate Change Secretary Ed Miliband has warned that the international talks in Copenhagen are not on track to deliver the ambitious agreement some are pushing for. With world leaders arriving at the talks in Copenhagen later in the week, the pressure is on negotiators to come up with a political agreement that heads of state and government can sign up to. Mr Miliband said not enough progress was being made in efforts to secure a deal to cut greenhouse gas emissions and provide funding to poor countries for development and adaptation to climate change.